When Avacyn Restored was being spoiled, one of the cards that turned a few heads amongst the people I know was Exquisite Blood. It opened at a fairly low dollar value, and has been selling for as much or marginally higher ever since. It’s easy to see why Exquisite Blood got some attention and was thought to be a ‘sleeper’ by some; except for a slight rearrangement of text, it is almost identically worded to Sanguine Bond which has been a $5 rare for as long as I’ve been playing, and is sparsely available. Unlike so many other rares, a retailer will typically only have a few of Sanguine Bond in stock, if any at all. This is usually the sign of a sought after card; low availability, and uniformity of price (above pocket change) across the board means that it’s worth is generally respected and its casual play value is at least broadly known, especially if it is has held a constant value and is not seen in vintage or legacy. Yet, these two cards are not the same, and are really quite different in the vast scheme of things. A small rearrangement of words in the text not only make these cards different in terms of the role they will play in a deck, but will also cause opponents to react in counterintuitive ways. The first interesting bit about these cards is that they will together infinitely damage a table of opponents the moment any of them takes damage or you gain a life. The loop is simple, gaining life will trigger Sanguine Bond, which will damage a player, which will trigger Exquisite Blood, whose life gain will trigger Sanguine Bond, repeating until there are no valid targets left (i.e. the table other than you is defeated, or the only players remaining have something like Witchbane Orb or Leyline of Sanctity). If there is any doubt to either card’s value, they at least have this. The second feature of these cards is that they are fundamentally different, despite having such similar wording. The most basic difference is that Sanguine Bond places opponents closer to losing in an awkward way, while Exquisite Blood places its user further from losing in a very forward way. Sanguine Bond essentially gives the player who controls it another way to deal damage to opponents. Lifelink creatures effectively do double damage, as do Drain Life effects like Exsanguinate, Corrupt or Essence Harvest, or to do potentially lethal damage by using Beacon of Immortality or a kicked Blood Tribute. When looking closely at Sanguine Bond, it can be thought of as an alternate win condition, like Epic Struggle, except that it operates on the same axis as the usual win condition. Something like Windbrisk Raptor can very easily let you swing with everything against one player, and then kill another almost without concern with how combat will play out. Doing damage through non-traditional means is very powerful and gives the Sanguine Bond player a way to generate advantage in a way that may not be easy to interact with. Part of the attraction is that it takes a bit of effort to make it work, using lifegain effects when you otherwise wouldn’t. Strangely, Sanguine Bond attracts less attention than many other effects threatening effects, despite it’s potential. This may be because the effect is so unique that it would be unwise to stock too many dedicated life gain cards. Dedicated life gain cards generally do not tip the balance of a game. Exquisite Blood, unlike Sanguine Bond, takes almost no effort to trigger; players need to take damage for it to start doing work for you. Like many other persistent ‘all opponents’ effects, it also attracts a lot of attention. Cards like Wound Reflection, Gisela, Blade of Goldnight and Bloodchief Ascension, the fact that you profit from another a player’s attack against a third party may not be well received. Further, if you begin to gain large amounts of life, players will quickly see it as potentially insurmountable if left unchecked. Usually, there is a certain amount of over-correction in this kind of scenario. 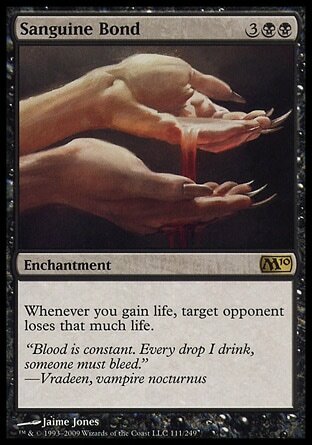 Exquisite Blood, also unlike Sanguine Bond, does not provide another way of winning the game (at least, not without Felidar Sovereign or Test of Endurance). This should only be slightly disappointing; if you’re racing damage with an opponent, Exquisite Blood makes it an uphill battle for your enemy. Examined closely, Exquisite Blood is a dedicated life-gain card. It rewards dealing damage, but deals no damage itself. This is an oddity in black; every other card that increases your life total in black deals damage, or at the very least is attached to a creature that can attack. If I had to choose between them, I’d say that Sanguine Bond is more interesting, and more deserving of its long-standing $5 price tag. Sanguine Bond manages to make an otherwise dry or boring mechanic (life gain) into something interesting, and potentially very powerful. Exquisite Blood simply gains life, and does so that might be imperiling in a multiplayer setting. None of this, of course, means that Exquisite Blood is bad, or even not a ‘sleeper’, but I highly doubt it will reach the not-quite-obscure status that Sanguine Bond has as it ages.